I had put away an article about the PRC’s control of textbooks in elementary schools, but somehow it disappeared. 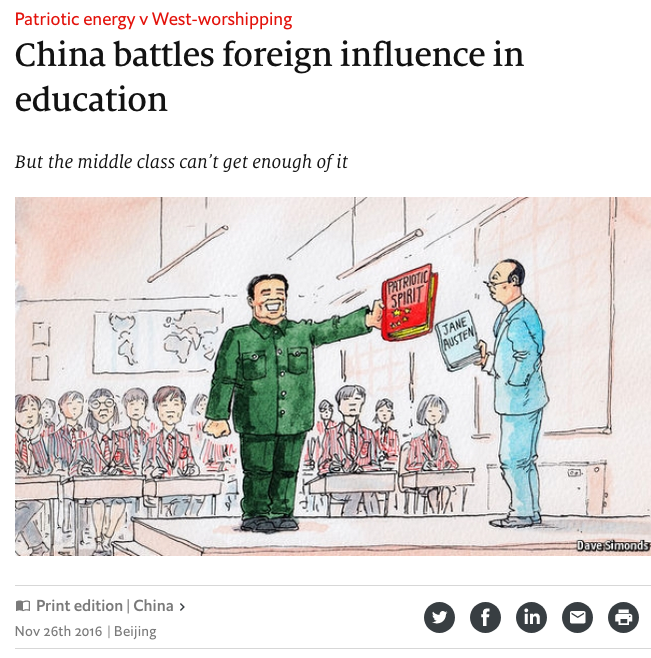 However, I did find this article that addresses education in the PRC: China battles foreign influence in education (see: http://econ.st/2ohbkLf, which is also the photo source). The Chinese have always been long haul players. Unlike many other cultures, the Chinese understand that influence requires frequency of messaging and controlling messages. One of the dilemmas faced by countries is how much influence they want to let in from the outside and who can access it. 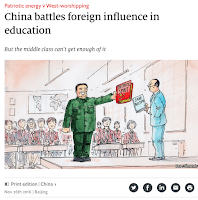 According to the article the last front in the influence war are international schools catering to Chinese citizens and migrants, non-Chinese citizens inside China. Attendance at these schools has, for the most part been restricted. As noted in the article “The Communist Party is instead seeking to inculcate young Chinese with its own ideological values: the new directive on for-profit schools calls on them to “strengthen Party-building”. After pro-democracy protests in Tiananmen Square in 1989, nationalistic “patriotic education” classes were stepped up in schools, a move that Xi Jinping, the president, has taken to new levels since 2012, seeking to infuse every possible field with “patriotic spirit”. “Morals, language, history, geography, sport and arts” are all part of the campaign now. Unusually, he also seeks to include students abroad in this “patriotic energy”. PSYOPers should be aware of the power of schools, even our own. If you have not taken part in your child’s career day you are missing an opportunity to share your experiences, but to also experience a bit of your child’s education. Clearly something every parent should do. 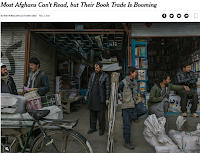 The 4 February 2018 NY Times ran a front page article “though Most Afghans Can’t Read, Their Book Trade is Booming” (see: http://nyti.ms/2FLxHOY) which is also the photo source). 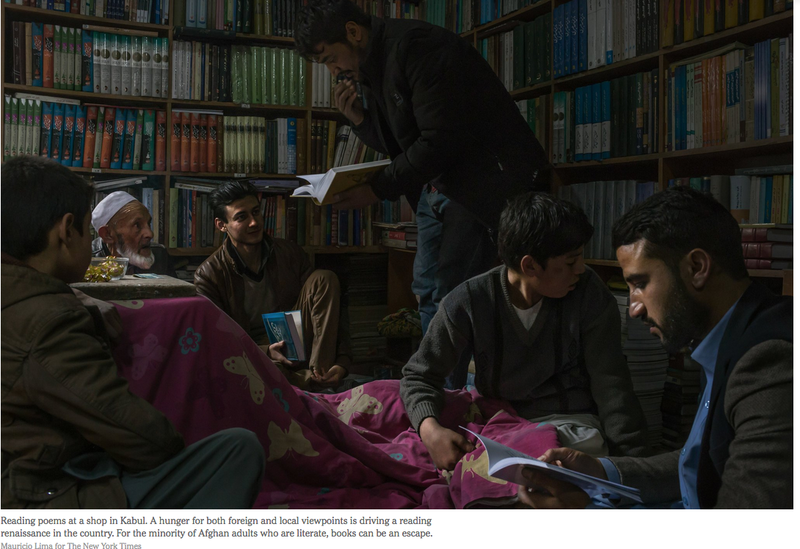 Kabul has 22 book publishers and 60 registered bookstores serving a population of over 5 million. Of course it’s not all blue sky. Translating a book from other languages can be problematic and, as to be expected in a country bereft with corruption, there is an increasing number of pirates who can sell 4 times as many copies as the legitimate publisher. 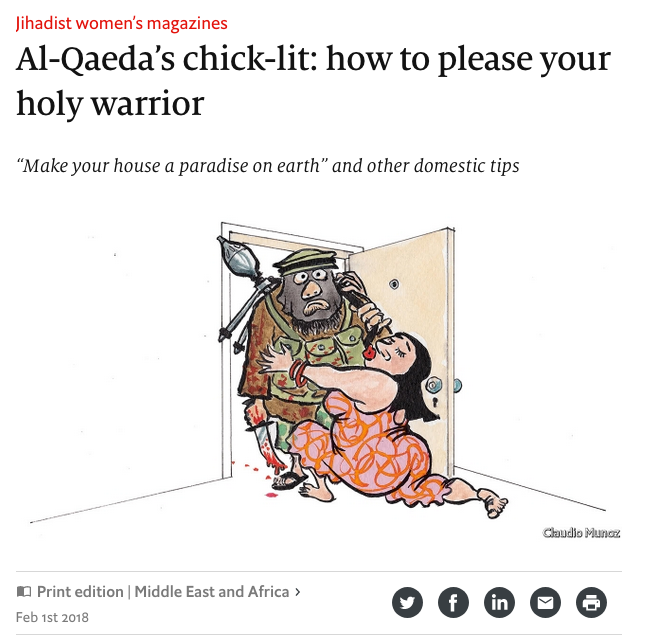 Given that the readers of books are exactly the kind of audience you would like to reach, does it make sense to foster publishing books that support the American messages? As it turns out self-help books, especially those offering to help the reader get rich are popular. 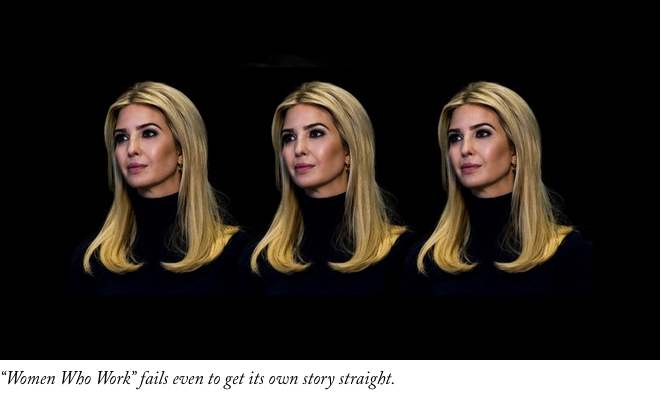 The article notes that Ivanka Trump’s “Women Who Work” is very popular, especially among female readers. That book was panned in a New Yorker Review in May 2017 (see: http://bit.ly/2nG1eTF). 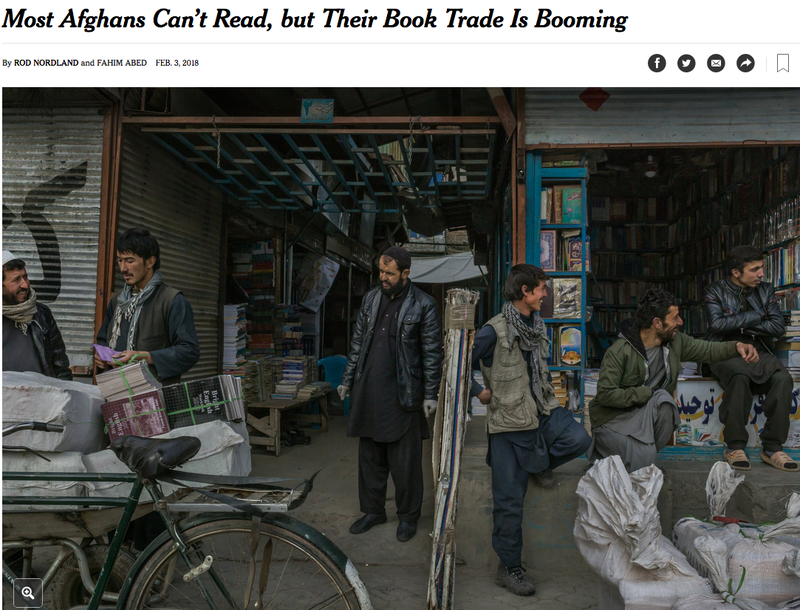 Nevertheless it is refreshing to read something that is not focused on Social Media and perhaps, just perhaps helping get the message across with an old fashioned book is the key to influence in Afghanistan. Books – Key to Afghan PSYOP?